Every year the New Zealand Music Commission makes a big fuss about the kiwi bands making an appearance at the auspicious South by Southwest (SXSW) music conference in Austin, Texas. I've always been a little cynical about this. The way it's been spun makes it sound like even getting on the bill is a sign of making it when in fact thousands of bands appear and I've yet to hear about an NZ act that made it big as result of making the trip. However, this year I've been following the conference on-line and it does sound like one hell of a good party. My plan now is to find some way of getting someone to pay for me to go to the next one. There are a host of Counting The Beat favourites in this year's line up and this podcast episode will feature some of them including The Ruby Suns and former Alternatui winners The Mint Chicks. 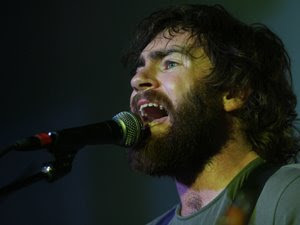 Also included are Rodney Fisher of Goodshirt and, the highlight, a couple of spectacular tracks from Liam Finn recorded live by America's National Public Radio at his show at this year's SXSW (you can hear his whole show here). Not featured is Wing, making an appearance this year as part of the NZ contingent.